First of all, how do scientists actually measure these changes? Because of the remoteness and vastness of Antarctica, satellite observation is the only feasible way to study the ice sheet. On a smaller scale these measurements are supported by airborne and field data. Three principal methods are used: satellite altimetry, satellite gravimetry and the so-called input-output method (IOM). In the IOM approach, as the name implies, estimates of the total ice input – the net snow accumulation or surface mass balance – are compared with estimates of the discharge of ice to the ocean (output). The discharge is calculated combining surface velocity measurements with ice thickness estimates. The independent and relative new gravimetry method determines changes in the ice mass directly by measuring tiny fluctuations in the earth’s gravity field. Satellite altimetry uses very precise repeat elevation measurements of the ice surface to determine volume changes. These volume changes can then be converted to ice mass using estimates of the density. Each of the methods has its strengths and weaknesses. In the study from Zwally and colleagues only the last so-called volumetric method is used. In his study Zwally uses data from different satellites for two periods: the ESA radar satellites ERS-1 and ERS-2 during the period 1992-2001 and the NASA laser satellite ICESat during 2003-2008. The surface elevation measurements are used to create maps of annual elevation change. These maps must be corrected for processes that do not influence the total ice mass, such as for instance firn densification (compacting of the upper layers of the ice sheet as the air is squeezed out) and to a lesser degree vertical movement of the bedrock underneath the ice sheet in response to changing ice masses. After the correction the remainder elevation change is caused by either short-term variations in snowfall on the one hand or dynamic changes of the ice sheet on the other hand. The latter are related to ice flow velocity and reflect the ice sheets slow response to changing boundary conditions such as climatic changes. A crucial step is to convert the volumetric changes to ice mass using density estimates. In this study meteorological models are used to separate the part caused by accumulation changes (with the lower density of snow), leaving in theory the part caused by dynamic changes (with the density of pure ice). Using this approach the scientists come to the surprising finding that during the study period (1992-2008) increasing ice losses in the coastal areas of West Antarctica and the Antarctic Peninsula are entirely compensated for by ice growth in interior West Antarctica and the much larger East Antarctic Ice Sheet. In other words, according to Zwally and colleagues the total (land) ice mass of Antarctica is increasing, buffering part of the – independently determined – global sea level rise. The authors caution that under current conditions this could change within the coming decades. The study from Zwally and colleagues drew a lot of criticism, as the claims contradict a decade of studies and measurements. One of the main arguments is that the used data and method is not accurate enough to support such firm conclusions. The signal scientists are trying to measure is only in the order of a few centimeters. Because of the vastness of the ice sheet, tiny errors or wrong assumptions could translate into huge quantities giving entirely different results. For this reason multi-disciplinary studies that try to reconcile mass balance estimates using different independent methods are deemed more reliable. Just a few years ago such a study reconciling ice sheet mass balance estimates was published in the prestigious scientific journal Science. The study, a collaboration of many research groups (including the group of Zwally) compared estimates of ice sheet mass balance derived from the three independent methods as described above. The outcome was an unambiguous ice loss in Antarctica. The slight gain in East Antarctica, in particular Dronning Maud Land since 2009, did not outweigh the tremendous loss in other parts of Antarctica. The consensus was a net ice loss of 71 Gigatons per year for Antarctica as a whole. Moreover the period of observations was longer running from 1992 to 2011. Nevertheless, even at that time there was an unsatisfactory spread in mass balance estimates, in particular for East Antarctica. The authors recommended acquisition of additional measurements with denser spatial and temporal sampling. The CryoSat-2 satellite, launched in 2010, adhered to this recommendation and subsequential mass balance estimates, that used this new altimetric satellite but also gravimetric satellites, confirmed earlier findings of overall ice loss in Antarctica. Moreover, the ice loss even appeared to accelerate. For example a study published last year by McMillan and collegues, that used CryoSat-2 data, reported a total ice loss of 159 Gigatons per year between 2010 and 2013. It is remarkable that in this new study only older data up to 2008 is re-analyzed without incorporating this newly acquired data. Figure 2. 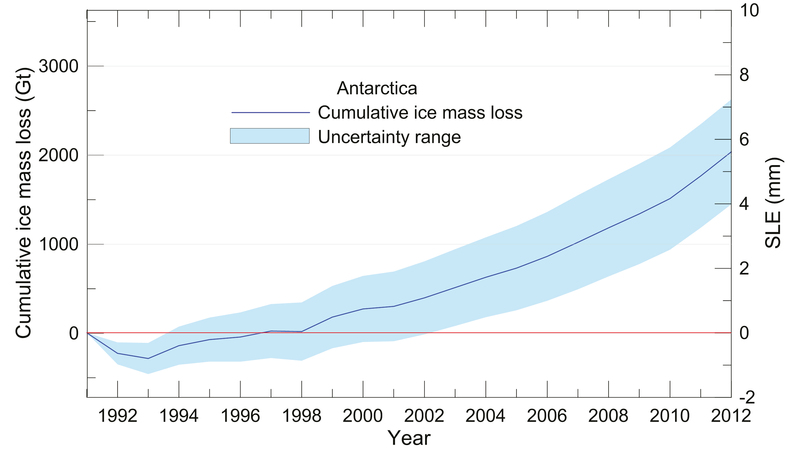 An overview of mass balance estimates of Antarctica from various studies. Each box represents the time interval (width) as well as reported uncertainty (height) of the estimates. The brown boxes, falling outside all other estimates, represent the outcome of the new Zwally et al. study. Source: Luke Trusel, Woods Hole Oceanographic Institution. At present the newly released study stands alone in its claim of ice gain in Antarctica, contradicting the bulk of scientific literature of the last decade, including other NASA studies, using in part the same data or completely different methods. At first it remains to be seen whether the conclusions of this study will hold after more thorough scientific evaluation. In that respect it should also be noted that the conclusions are not specifically endorsed by NASA as portrayed in many of the media reports. Nevertheless, if the conclusions are right than it actually raises many new and interesting questions, such as, if not from Antarctica, where does the part of sea level rise thus far ascribed to it come from? Perhaps the part of other sea level rise contributors has been underestimated thus far. In that case we could even end up with more sea level rise if in the coming decades Antarctica does not act as a buffer anymore as the study suggests. – Press release Nasa about Zwally et al. – RealClimate: “So what is really happening in Antarctica?”. – Explainer from Prof. Richard Alley on Zwally et al. – Original Dutch version on Klimaatverandering. This entry was posted on November 25, 2015 at 22:01 and is filed under Antarctica, Sea level rise. You can follow any responses to this entry through the RSS 2.0 feed. You can skip to the end and leave a response. Pinging is currently not allowed. As an aside, is there any list out there of the factors that go into sea level rise in models? For example, draining of aquifers and surface water, isostatic rebound, etc? On another point, my understanding of AGW theory is that an increase in temperature would result in additional precipitation in very cold areas like the Eastern Ice Sheet of Antarctica. The average temperature there is below -40, and below that temperature there is pretty much no moisture in the air, which is why Antarctica is considered on the whole to be a desert. Thus we would expect that at lower elevations there would be ice loss, while at higher elevations and inland there would be increase precipitation, which would maintain some degree of stasis. Accretion of ice will exceed ablation of ice in those places. It’s why I viewed Zwally’s study as evidence of a warming global climate. Thirty years ago we expected more ice on the Eastern Ice Sheet. Only in the last ten or twenty years has the narrative been “ice melting and sea level rise.” We expected ice mass ablation on the Western Ice Sheet and Peninsula. We saw it. We expected ice mass increase on the Eastern Ice Sheet and by golly by gee we now have evidence of it. If you can point out some errors in that logic, I would certainly appreciate it. it’s like to see ice mass accretion on the Eastern Sheet fits the hypothesis but doesn’t fit the narrative. 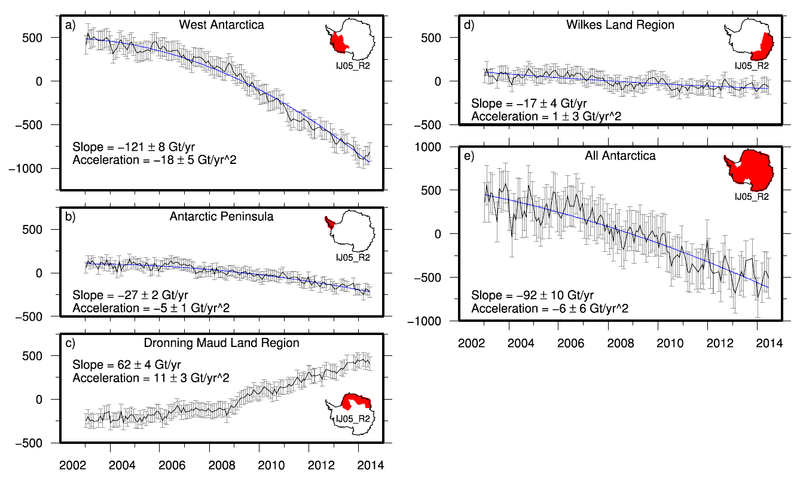 Zwally et al report a mass gain for all Antarctica, not only for East Antarctica. That makes this study an outlier, see figure 2 in the post. They report the largest mass loss for West Antarctica with -121 Gt/yr. Thank you. I had misunderstood. I thought that the study focused on East Antarctica, and due to the mass gain found that more ice may be accreting on the East than is a laying elsewhere. Which I didn’t think was so contradictory since I didn’t think it had actually been examined. I understand the error. Next question: Why is this not evidence of warming, and specifically of anthropogenic warming? Was this not predicted? It’s like I saw the reports and figured, “dang. This is exactly what I was hoping to see!” And then I see the deniers laud it while the warmists were horrified. And my understanding was of scratching my head because the first stuff I read on AGW said that this would happen. That was only about 14 years ago, a warming planet could at first lead to ice gain in Antarctica. Now most studies find a mass loss, so it looks like things are changing faster in Antarctica than previously assumed. Or not when this study of Zwally et al turns out to be correct, but as Jan Wuite writes: “..it remains to be seen whether the conclusions of this study will hold after more thorough scientific evaluation.”. A healthy scientific discussion, it’s up to the scientists now, but this study presents no evidence against the global warming theory as some try to make people believe. Professor Richard Alley (see link at the bottom of the post) says it’s wise to avoid the one-paper syndrome, stick with the IPCC and let the scientists come with another authoritative assessment that takes all estimates into account. “Sticking with the IPCC” means their latest IPCC AR5 report, in which you can find the graph below (fig. 4.16) about the mass loss of Antarctica and its equivalent in sea level rise. Awesome. Thank you for laying that out so clearly and kindly. I appreciate that you took the time to explain it to me. One thing think people need to consider is, the sea level budget, once the Carling Hay paper was included, was balanced. That included a contribution from Antarctica. Zwally would throw that back out of balance… I believe by .5mm per year. It doesn’t prove anything, but auditors like balanced accounts for a reason. Talking about 71 Gt as a ‘huge mass loss’ is very strange. There are more than 150 million Gt of ice in Antarctica. Antarctica ‘loses’ millions of Gt every summer and gains it back in the winter. The words ‘huge mass loss’ do not appear anywhere in the article, nor in the comments (apart from Tom Fuller’s and now mine in response). Thank you Marco–I misread the text. For clarity’s sake, it takes 361 Gt to raise ocean sea level by one millimeter, 9,137 Gt to raise sea level by one inch. In the hopes of being equally as pointless, I need to know how many Gt does in take to raise sea level by 2 mm and by two inches. I have done some climate change research for my Physics class and the rise in CO2 in the atmosphere is a major problem. CO2 rising in the atmosphere causes the infrared rays given off by the sun to be trapped within the atmosphere and heat up the Earth’s surface. This has caused the average temperature of the Earth’s surface to increase by 1.5°F in the past century. If the CO2 increase continues it will cause the Earth to heat up even more. This would then cause parts of the Earth to increase in temperature and making ice melt if the temperature were to push above 32°F. This would then possibly cause water levels to rise. For my physics class we are doing a research project on climate change. I read your article and I agree that the sea level is rising and that it’s a major problem. I didn’t now that scientists were debating on where from, and i didn’t know the exact amount in mm that it rose per year. I would like to know how you think they could put a halt to the rising sea levels? Also, what happens if they do nothing to stop the rising sea levels? What affect will it have on people? Animals? If the temperature drastically increases, or just continues to increase per year, how long until repercussions start to happen? Thanks for taking the time and good article. I’m currently a physics student in high school and i agree with your findings. we need to slow the artic melting. and more then it just affecting climate, think of the effect on business it would have.. Beach business are very lucrative with the rising sea levels their business right in the middle of the danger. Company need to cut down on CO2 pollution. People who still argue against climate change need to look at actual facts. drew, you are correct as far as you go, but a good portion of the current sea level rise is actually called ‘steric.’ That means that the sea level is rising because the oceans are getting warmer. Jacob, sea level rise is currently estimated at about 3.2mm per year, plus or minus 0.4mm. It has been rising at that rate for a bit more than a decade. You ended up at a good weblog. If Bart Verheggen has time to respond to your comments, you can trust what he says. I’m just another dude on the internet. That’s mostly correct. One nitpick, it’s more correct to state “CO2 rising in the atmosphere causes the infrared rays given off by the *earth surface* to be trapped within the atmosphere, hence preventing heat loss to outer space and heating up the Earth’s surface”. Tom rightly mentions steric sea level rise to thermal expansion. See also what Dr Wuite wrote about that in this blogpost: “The principal causes [of sea level rise] are clear: global decline of land ice (mountain glaciers & ice sheets) and thermal expansion of ocean water (water expands as it becomes warmer).” Moreover, the melting process of land based ice could conceivably be accelerated by mechanical instability of portions of the ice sheet, though this is an active research area and still fraught with uncertainty. You ask how we can halt sea level rise. Since current sea level rise is caused by global warming, and that in turn is mostly caused by the build-up of greenhouse gases, it follows that decreasing the build-up of greenhouse gases in the atmosphere would also slow down sea level rise. Sea levels respond very slowly to a change in temperature though, and temperature in turn responds slowly to a change in emissions. See e.g. this (non-exact) animation https://www.climateinteractive.org/tools/climate-momentum-sim/ So while we *can* limit the sea level rise in the long term (centuries to millennia) by curbing GHG emissions, in the short term (decades to centuries) some sea level rise is “locked in” and we’ll have to adapt to that. See also this recent paper that goes into more detail into the long-term effects of our emissions on e.g. sea level rise: http://www.nature.com/nclimate/journal/vaop/ncurrent/full/nclimate2923.html Low lying delta’s will be increasingly challenged to cope with this sea level rise, e.g. in terms of protection from flooding from then sea as well as from rivers, salt water intrusion etc. A rich country such as the Netherlands might have the (technical and economical) means to adapt to a *modest* sea level rise, but a poor country such as Bangladesh would not. If we continue on a business as usual emissions path, the map of the world will have to be redrawn eventually. See the abovementioned publication for example. The amount of effort you put into writing this article allowed me as a student to really get an understanding for how much of an issue the overall temperature rise can effect water levels and the different ways it can effect water levels in oceans. I also notice that if it does increase how much land will be “eaten”? How will this effect coastal cities and furthermore the new flow of people from coastal lands to the less populated inner cities? Hi Donny, Again remember that I’m just a dude on the internet, but statistician Richard Tol and another person named Yohe estimated that if sea levels rose by 50cm we would lose about 0.23% of land currently considered habitable (so, not counting Antarctica). Pity that the very small proportion includes some of our favorite places.